“Waiter there’s something in my bread” really encouraged my bakery instincts! After the bread I baked yesterday my only thought was: “Bake! Bake! Bake!”!!! Plus I was truly inspired by some of the wonderful entries, and especially by Patricia‘s recipe, so I hope she won’t mind if I made something similar, yet different, to her wonderful Berry Twist Bread! First make the dough. As usually I’ve used my wonderful Kenwood chef with the kneader hook. 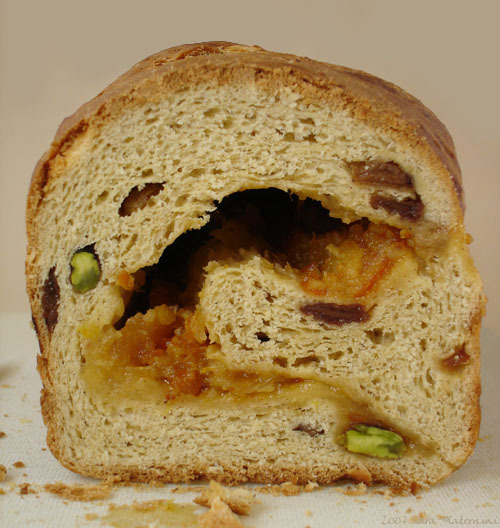 In the kneader bowl dissolve the yeast in the milk, let it rest for 10 minutes, then add all the ingredients, except raisins, pistachio nuts and marmalade. Begin to knead at the lowest speed and after 10 minutes, knead at speed 2 for 5 minutes, then lower the speed at minimum and knead for another 5 minutes. Make a ball and let it rise for 1 hour and half, covered with a tea towel. After the given time, knead a little (by hand this time) and begin to add raisins and pistachio nuts. Once they are completely mixed with the dough, roll it out on a floured surface on a rectangle 1 centimeter thick. Spread it with the marmalade (I’ve used homemade orange marmalade), roll it, fasten the ends, and let it rise for another hour in a cake pan. Preheat the oven at 170° C.
Once is well risen again, bake it for 30 minutes. Serve cold with a nice mug of coffee! I love your blog. The photographs are amazing. Excellent work here. Ummmmm this bread you made is my kind of bread to have with a lovely cup of tea. I like it because it is flavourfully spiced, has fruit, nuts and a lil marmalade – what’s not to love. Sara, my dear, of course I don’t mind – I’m very flattered, that’s true! Slurp, ha un aspetto davvero invitante!